What’s more even more vibrant than the Flinders Street Station precinct in peak hour travel times? Being in and around Flinders Street Station during one of Melbourne’s legendary big events. Everyone’s got somewhere to go and they usually want to get there fast. And each January, the transport hub is even busier than normal when one of our biggest international events – the Australian Open – comes to town. For visitors new to our city, navigating your way through Melbourne’s public transport system can be incredibly convenient and affordable – but it always helps to know exactly where you’re going. 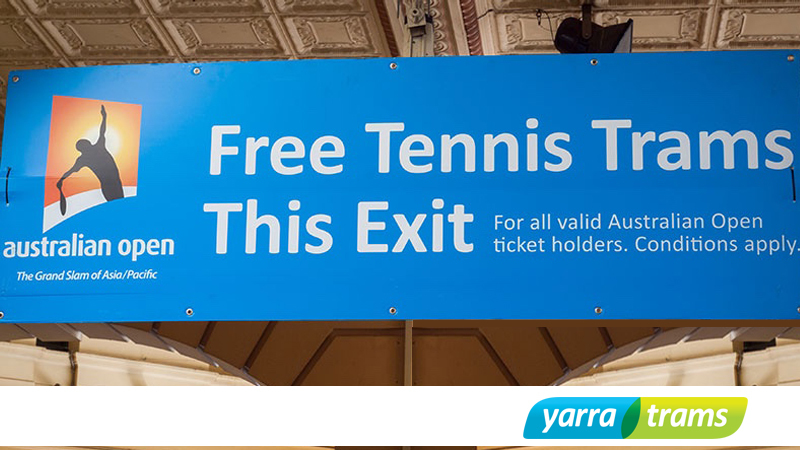 That’s why our team at Barneys love working with the Australian Open and Yarra Trams each year (is it wrong that we love telling people where to go?) You know those big, easy-to-read signs (both vinyl banners & corflute signs) you see at all the entry points and barriers at the Station and at all the key tram stops in the immediate area? At Barneys we produced, printed and installed them – helping tennis fans head in the right direction and delivering effective signage solutions that look good. Clear marketing has the power to cut through confusion and our vinyl banners lead the way in style. By using quality corflute signage, we were able to deliver to the client’s brief – on time and at a great price that helped Australian Open fans enjoy their experience traveling to and from the tennis and ensured the hard-working team at Yarra Trams managed their crowds in an effective and stress-free way. Well, we are part of one of the world’s most liveable cities – so it’s nice to think we’ve had some small part to play in someone’s happy special event experience. If you’d like to see what we can do with vinyl banners & corflute signs for your event, contact us on 1300 663 812.